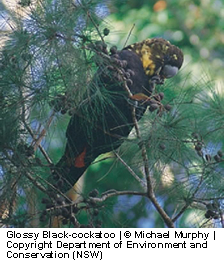 The Glossy Black Cockatoo (Calyptorhynchus lathami) is the smallest member of the subfamily Calyptorhynchinae found in Australia. The species is uncommon although widespread throughout suitable forest and woodland habitats in Australia, from the central Queensland coast to East Gippsland in Victoria, and inland to the southern tablelands and central western plains of NSW, with a small population in the Riverina. An isolated population exists on Kangaroo Island, South Australia. This species inhabits open forest and woodlands of the coast and the Great Dividing Range up to 1000 m in which stands of she-oak species occur. In the Riverina area, they inhabit open woodlands dominated by Belah (Casuarina cristata). The Australian Government has listed the South Australian race, (including Kangaroo Island), halmaturinus, as being endangered. They feed almost exclusively on the seeds of several species of she-oak (Casuarina and Allocasuarina species), shredding the cones with the massive bill. 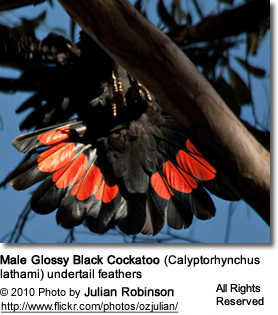 They dependent on large hollow-bearing eucalypts for nest sites. One or two eggs are laid between March and August. An adult will grow to be about 46-50 cm or 18 - 20 inches in length. 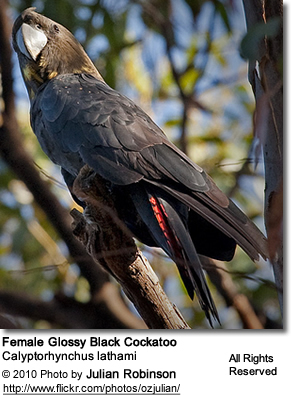 Males are almost completely black, excepting their prominent red tail bands. The females are dark brownish with some yellow spotting. The female's tail is barred whereas the male's tail is patched. Three subspecies were proposed by Schodde et al. in 1993, though Forshaw has reservations due to their extremely minimal differences. Glossy Black Cockatoo - Calyptorhynchus lathami lathami (Nominate Species - rare) - The eastern subspecies found between southeastern Queensland and Mallacoota in Victoria, with isolated pockets in Eungella in central Queensland and the Riverina and Pilliga forest. It inhabits casuarina woodland. Conservation Status: Listed as threatened on the Victorian Flora and Fauna Guarantee Act (1988). On the 2007 advisory list of threatened vertebrate fauna in Victoria, the subspecies C. l. lathami is listed as vulnerable. C. lathami erebus - Occurs in central Queensland. C. lathami halmaturinus: (Endangered) - The Kangaroo Island subspecies has been listed by the Australian Government as endangered. Restricted to the northern and western parts of the island, the population may be as low as 100 individuals. It depends on the Drooping She-oak (Allocasuarina verticillata) and the Sugar Gum (Eucalyptus cladocalyx) In particular, the bird specializes in the most recent season's cones of Allocasuarina verticillata over older cones of that species and Allocasuarina littoralis. It holds the cones in its foot and shreds them with its powerful bill before removing the seeds with its tongue. 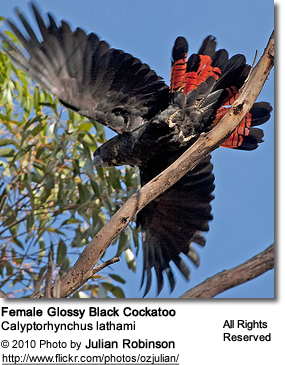 As this species is rare and at risk of extinction, every effort should be made to place any eligible captive glossy black cockatoos into a well-managed breeding program to ensure their survival. If individuals of this species are not good prospects for breeding for whatever reason and you are considering it as a pet, the following should be of interest.